•	This FREE pregame celebration includes s'more bars and hot chocolate. 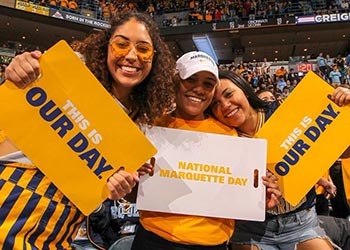 •	The first 500 attendees will receive a voucher for a National Marquette Day T-shirt redeemable at halftime of the the women's basketball game. Food, friends, and fun. Get game-day ready and put those idle hands to work making some of the coolest crafts on Pinterest! Breakfast, swag giveaways, and a Marquette-themed photo booth. Buses to the Men’s Basketball game will leave for the Fiserv Forum from The Commons. Don’t have game tickets? We’ve got you covered. Cheer on our Golden Eagles as they take on the Villanova Wildcats. Every fan in attendance will receive a free T-shirt. Find clues, solve riddles and work together to escape one of five themed rooms. Come solo or with a group to experience the puzzles for free on campus.